1. Blends in to match all skin tones. 2. Hides pores & flaws. 3. Absorbs oil while allowing your skin to shine with radiance. 4. After applying, skin looks smoother & more uniform. Instock : left 1 only. 1. Package comes with 2 concealer pens. 2. One is in a lighter whiter tone to conceal dark eye rings, dull T-zone areas and both sides of noses. 3. Another is an apple bright tone for cheeks to create a 3D effect. 5. Highly effective in concealing spots & blemishes, thus revealing a glossy & crystal clear skin. 6. Has a deep moisturizing & nourishing effect on the skin. 7. Able to repairs spots & whitens skin. 1. Just apply it on places which you want to conceal. 2. Rub gently & spread it. 1. Made especially for concealing dark eye circles. 2. Able to cover up fine lines & small flaws around the eyes. 3. Contains moisturizing elements, thus able to moisturize skin area around the eyes, & prevent dryness. 4. Can be used to brighten up your complexion. 1. 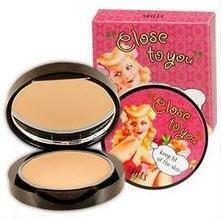 Just apply the right amount, and rub it to spread out the concealer. 1. Can be used as a make-up base. 3. Able to blend in with your skin colour well. 4. Easy to use & gives a refreshing sensation. 5. Not oily at all & covers up pores & pimples effectively. 6. Prevents dryness & unbalanced skin tone. 7. Controls oil secretion & refine pores. 1. Covers up pimple scars, fine lines, pores, pigmentation spots, unbalanced skin tone. 2. Able to brighten up skin complexion. 3. Blends with your skin, & smoothen skin. 4. At the same time, moisturizes skin & prevents oily skin.